KOWAIT - Kuwaiti National Council for Culture, Arts, and Letters (NCCAL) announced Monday the signing of an archeological agreement with British department of Archaeology in Durham University. The mission is designed to carry out exploration for relics in the Kuwaiti Kathma area. Kathma is a historical region, rich in relics that date back to times after birth of Islam and early years of the Islamic empire. Archeologists will examine sites of the Islamic period, namely in the area of Jal Al-Zour and Kuwait Bay, NCCAL said in a press statement. Secretary General of NCCAL Ali Al-Yoha signed a one year agreement with head of UK mission Dr. Derek Kent, with presence of Director of the Department of Antiquities and Museums of NCCAL Shehab Al-Shehab. He pointed out that this would be the third cooperation accord between Kuwait and UK. KCCAL also signed today a contract with Italian University of Perugia, to conduct archaeological excavations on the island of Failaka, to search for antiquities dating back to the late Islamic period. USA– Dakota - Sunday’s speak, Michael Fosha, shared information and slides on several caches of lithic bifaces found in what is now South Dakota and surrounding states. One cache in Clark County, for example, contained nothing but mauls, or heavy stone weights. The cache was found at the edge of Dry Lake. 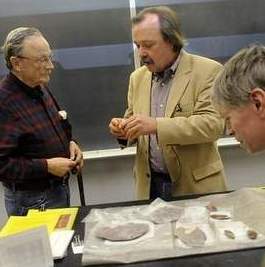 “Clearly, it was a seasonal cache,” said Fosha, of the Archaeological Research Center in Rapid City. He suggested that the mauls were kept at the lake’s edge so when the muskrats built their huts, the mauls could be used to break apart the mixture of mud and vegetation, then clobber the animals, valuable for their pelts and as protein. “Most caches were located in isolation, possibly so they are not plundered,” Fosha said. Caches could have several functions. Ritual caches were used to store tools to be used in the afterlife or for special ceremonies. Utilization caches included insurance, the exchange of loads or seasonal needs. Another cache in South Dakota is located near Lost Hat on the Missouri River. Two-hundred bifaces were discovered in the Lost Hat cache. The stone for those bifaces transported on the river from a site in what is now North Dakota. The North Rhind Butte cache north of the Black Hills was known for years, but after a sand storm Fosha and others found themselves summoned to the site quickly by landowners. The wind had scoured the fine grains of sand protecting the artifacts, allowing them to emerge from the ground. Those arrowheads and scrapers possibly could be dated to the Clovis culture. That would place their age at about 12,000 years. INDE – Panchkula - The white-washing of over-a-century-and-a-half-old frescos at the Mansa Devi Temple is not only against rules of restoration of old and rare works of art but would also damage these rare paintings on the walls of the shrine, feels Indian National Trust of Art, Culture and Heritage (INTACH). The temple, built by the royal family of Patiala, is under the Haryana archaeology department, while Haryana Tourism Corporation is the nodal agency responsible for execution of the ongoing conservation work. The work on frescos inside the temple started around 1840 under the patronage of Maharaja Gopal Singh of Manimajra and Maharaja Karam Singh of Patiala. 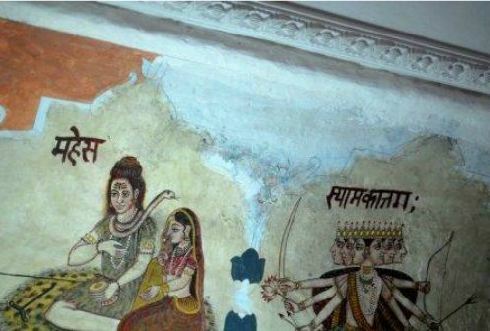 While TOI has photographs (taken on January 10) showing layers of white wash applied on the frescos, a statement of Haryana's directorate of information and public relations said that 'no white wash is being done on the frescos'. 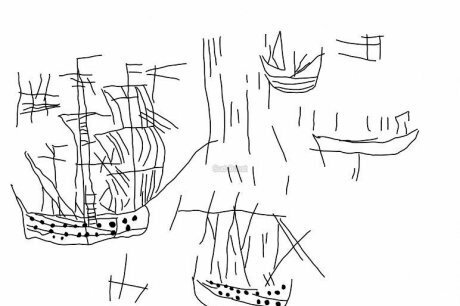 ROYAUME UNI – Cornwall - The processes behind building the oldest boat ever found in Western Europe will be investigated by a team of modern- day maritime experts. Archaeologists from the University of Exeter will lead the project at the National Maritime Museum in Falmouth as they attempt to rebuild a sewn-plank boat, examples of which date to around 2000 BC. The Bronze Age vessels, which measured up to 16 metres in length, are thought to have been unique to England and Wales. "Because none of the boats have ever been found as complete boats, this project will seek to understand how they were constructed, how to steer such a long boat, measure how fast it can go, understand how the crew used paddles, as sails were not evident, and how watertight it is," said Professor Robert Van de Noort, an archaeologist at the University of Exeter. The hulls of these prehistoric boats were made by stitching together planks of wood using fibres from yew trees because nails had yet to be invented. The boats helped to establish Cornwall as a trading region, ferrying gold and copper to and from Ireland. The team plan to use only ancient tools, such as Bronze Age axes and adzes. "No-one has done this for 4,000 years so I am sure we will come up against some difficulties, but we think we have given ourselves enough time to give it a good go," said Prof Van de Noort. USA - Savannah River - Savannah River Site historian George Wingard's fascination with the slave potter known as "Dave" began with a phone call in 2006 and led to an upcoming film honoring one of the South's most mysterious artisans. "That morning, we had people looking around in an area where some monitoring wells were planned," said Wingard, the administrative manager for the Savannah River Archaeological Research Program, whose workers are required to evaluate areas to be disturbed by construction. As routine, random test holes were dug to determine whether any important artifacts might lie beneath the soil, the technician discovered the proverbial needle in a haystack: a large, greenish-glazed shard of stoneware pottery. "When he pulled it out, it had 'Dave' inscribed on it," Wingard said. "He called me right away, from his cellphone." Both men knew immediately the find was an important one. Dave was a slave who worked among the dozens of potteries that operated during the 1800s throughout South Carolina's plantation-strewn "Edgefield District" near Augusta. The region's alkaline-glazed pottery is widely sought by art collectors, but the works of the mysterious Dave are the most prized examples of all. Further excavation at the remote hillside within Savannah River Site yielded more pieces of Dave's handiwork. "We were digging in what turned out to be a mid-20th century trash pile," Wingard said. "We found about 95 percent of the jar." In addition to Dave's signature, the jar - which was carefully reassembled - carried the date of manufacture: April 16, 1862. Wingard's interest in Dave's legacy expanded. He soon teamed up with Augusta filmmaker Mark Albertin, of Scrapbook Video Productions, and they began work on a documentary. IRLANDE – Pollagh - Theresa McDonald, Managing Director of the Achill Archaeological Field School, voiced her objections this week over the Achill-Henge which was built at Pollagh in November by Joe McNamara. The archaeologist believes that a prehistoric site could be less than half a kilometer from where Achill-Henge is now standing. McDonald said, “We’re worried that there is an archaeological site, mostly prehistoric, less than half a kilometre from the site. It is mostly covered by bog, as are a lot of sites in Ireland. 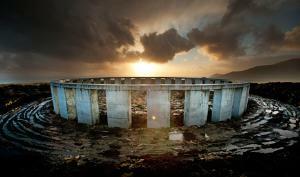 The Achill-Henge was constructed in November by architect Joe McNamara and resembles the famous Stonehenge structure.